The Big Bad Bird is Back! 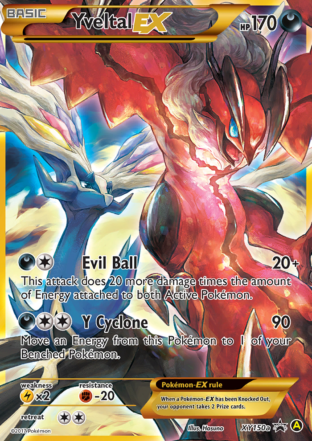 Recently on Pojo.com, we reviewed Yveltal GX. To no one’s surprise, that Pokemon simply can’t function as a feature deck in today’s meta. At one point in the review, I commented that I thought you would have more success with Yveltal EX than with GX. I went 1 W 1 L against Buzz, 2 W 1 L against Necrozma GX, 2 W 0 L against Zoroark GX, 0 W 3 L against Volcanion (those were some real throw back battles), 0 W 2 L against Greninja. Yveltal is still really good paired with Garb, and I’d bet there’s a better list out there. Choice Band might be better than FFB, but that boost in HP made a HUGE difference in a lot of games. I just know there were several times when I was hoping my opponent wasn’t playing Field Blower not just because of breaking ability lock but also because there were between 170 or 180 damage counters sitting on my active Yveltal. I will say that there were some matches where my opponent conceded when I got Garb down and / or activated. And there were some matches where my opponent Guzma’d Garb and went on to win (and there were matches where they KO’d Garb … and nothing else), so it’s not just Yveltal it’s that Garb is still really disruptive. A lot of people are cutting their Leaf Blowers (myself included) because Garbotoxin Garb is so rare. I’ve seen Garbotoxin Garb seven times in 259 matches this month. People love playing with abilities, nobody wants to run Garbotoxin Garb… it’s just not as much fun. Plus, I did demonstrate in one of my earlier meta analyses that Garbotoxin will help you get into the top 64, but it had a HUGE dropoff between top 64 and top eight. Despite having a relatively large representation in successful top 64 lists, BKP Garb almost never made it into the top eight. But like I said, feel free to add and subtract cards as you like, I don’t think this is the best list, this is just the one I went with. Good luck and have fun with a pretty good throwback deck. Whoa. I was looking at this card the other day, wondering if it was still viable. Glad to see you found it to be useful. I remember when this card came out. It hit like a ton of bricks. Strong as heck, weak to lightning, which back then was a bit of a liability (Riachu Circle Circuit, Mega Man, Joltik, etc.) However it wasn’t like today where Fighting weakness was death to a deck. There was more balance to the game, save for maybe night march. But you’d come across a lot more diversity: Seimitoad, Vespiquen, Lucario, Machamp/Ariados, etc. than today. I finally tried the deck out myself for a daily challenge: do 1000 damage to opponent using dark types. Perfect. Only needed to play one game to finish it, but arguably…it was probably the most painfullest game I’ve ever witnessed. Picture it like this: what do you do when you play Metagross, use up all your Field Blowers (or the last one is prized), and your opponent gets to peck at you with Garb active. Maybe they were doing a challenge as well, but it was a prolonged suffering. Didn’t even mind the Max potion plays: it was gunna go one of two ways, either they deck out or they lose to Yveltal. Now I did add Hoopa to the deck…which was silly of me cuz Garbotoxin was out and I was like, “Yikes”. Then again if they field blowered the float stone off Garb then Scoundrel Guard would go online, so no the most terrible play…but I am taking him out the list. On to ideas for your build: consider Field Blower as well. This Metagross player was using Frying Pan and well…it was cringy at times to remember missing a knockout on Metagross by 20 HP. Brutal frying pan on metagross. Yeah, too many Baby Buzzwoles running around for Hoopa to be effective. My goodness yes…I mean you do need Choice Band for Metagross, but Frying Pan hurts to face when all seems so perfect. If anything Dusk Mane should use Frying Pan instead: they already hit like a truck, why not bump up it’s defense while allowing it to fend off a Fire attack or two? On a side note I was trying out Passimian…kept facing things that just messed me up inside. Probably played the deck wrong, but Passimian didn’t feel right. Rainbow Road however was alright.